Dr. Diann J. Prosser examining a ruddy shelduck in China. Photo Credit: J. Takekawa, USGS. Dr. Diann J. Prosser was awarded the Presidential Early Career Awards for Scientists and Engineers (PECASE). The PECASE is the highest honor bestowed by the United States Government on science and engineering professionals in the early stages of their independent research careers. Dr. Prosser was recognized for her scientific leadership in developing an international interdisciplinary program to understand the role of wild birds in the spread of lethal avian influenza viruses, and for exceptional outreach to the public and mentoring at the high school through postdoctoral levels. Dr. Prosser has been instrumental in developing data visualization techniques and modeling approaches to understand the emergence, movement, and potential transference of highly pathogenic avian influenza viruses from wild bird populations to poultry and humans. 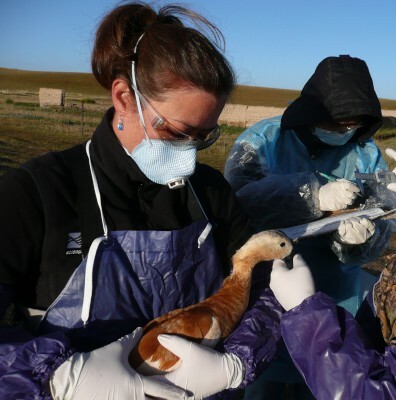 Understanding the real versus perceived risks to human health and the Nation's food supply due to avian influenza requires scientific knowledge of the behavior of these viruses in the environment and their emergence at the interface between wild and domestic bird populations. Dr. Prosser's research is supported by the U.S. Geological Survey (USGS) Contaminant Biology Program, Environments Program, and Wildlife: Terrestrial and Endangered Resources Program.